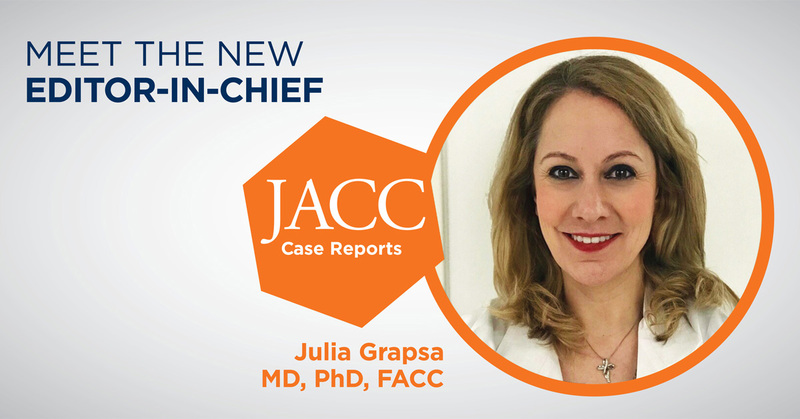 The American College of Cardiology (ACC) will begin publishing a new journal, JACC: Case Reports, beginning in June 2019, with Julia Grapsa, MD, PhD, FACC, serving as Editor-in-Chief. JACC: Case Reports is an open access journal, serving a forum for promoting clinical cases and clinical problem solving. It will accept everyday educational or rare clinical cases, well described and with clear learning objectives. Furthermore, the journal aims to serve as a publication vehicle for early career cardiologists and members of the cardiovascular care team, and as a forum for mentorship on the review and publication process. Julia Grapsa, MD, PhD, FACC, is currently a consultant cardiologist at Barts Health NHS Trust, home to Europe’s largest specialised cardiovascular center at St Bartholomew’s Hospital, and is head of the Echocardiography Department at The Royal London Hospital. She is also an associate professor at University College London. Her areas of research include pulmonary hypertension and the study of right heart remodeling with multimodality imaging. Grapsa has served as chair of the young community for multimodality imaging for the European Association of Cardiovascular Imaging and as a member of the European Society of Cardiology education committee, leading the ESC clinical case gallery. She is already a part of the JACC family of journals, serving as an editorial consultant for JACC: Cardiovascular Imaging. A second new journal, JACC: CardioOncology, will launch in September 2019. Sign up now to receive issue alerts and editorial updates for the new journals at JACC.org/ContentAlerts.